These Afterburner Zip Motorcycle Boots from Milwaukee add sizzle to your ride. They feature good looks and utility that combine to make them fun to wear. They're made of top quality, genuine full-grain leather for comfort and long wear. The zip style is convenient and comfortable, and you don't have to mess with laces. 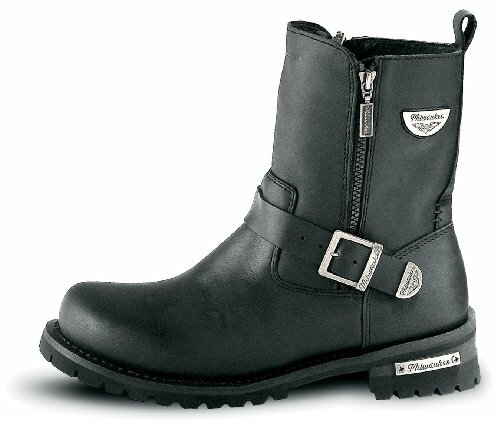 More features: Double zippers make them easy to put on and take off; Side strap and buckle give you a secure, custom fit every time; Logger outsole is non-skid, non-marking and oil resistant; Fully removable cushion insole provides superb comfort; Freedom Flex construction means no time breaking in your boots; Men's Boot measures approx. 10", weighs 48 ounce. Women's Boot measures approximately 9 inch, weighs 40 ounce. Get ready to hit the road with a pair of these Boots! State Size. If you have any questions about this product by Milwaukee Motorcycle Clothing Company, contact us by completing and submitting the form below. If you are looking for a specif part number, please include it with your message.